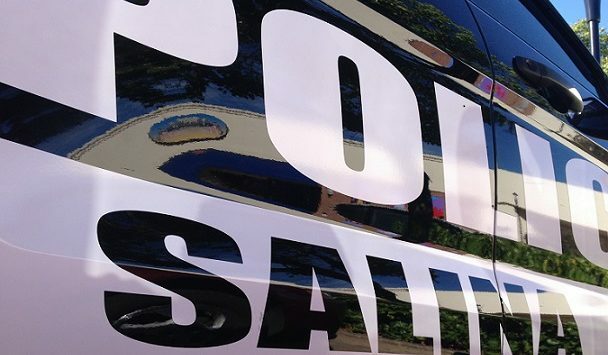 Salina Police are in search for a known suspect after multiple vehicles were damaged in a south Salina apartment complex early Wednesday morning. Police Capt. Paul Forrester tells KSAL News that a 23-year-old Salina man was awoken at 1:20 a.m. when he heard banging and the sound of breaking glass in the parking lot of his apartment complex at 821 E. Wayne. The man looked outside to see two females and one male. The man saw the male subject swinging an object at a vehicle. The man then went outside to check on his 2012 Ford Fusion to see if there was any damage to done to his vehicle. At that moment, the man saw an orange Ford Mustang turn around and come back to the parking lot. The same male subject stepped out of the car and begun to hit the victim’s side window leaving only scratches resulting in $200 damage, before the subject sped away. Forrester says that there was another victim, a 52-year-old woman, whose 2010 Mazada MX6 sustained heavy damage as both taillights, the driver’s side window, the driver’s side mirror and windshield were all busted. Damage to her car is listed at $1,500. According to Forrester, police have a possible known suspect they are looking for.